Sensor Signal Conditioning Products - Robert Owen Inc.
ROI-XMA 4-20mA sensor transmitters are used where weak sensor signals need to be connected long distances to a PLC or data acquisition system, or when the system needs to read sensor types that are not normally compatible. Use 4-20mA sensor transmitters to connect sensors to your PLC. Easily add Thermistor temperature sensor measurement, RTD temperature sensor measurement, or Potentiometer position/level measurement to your PLC 4-20mA input. The ROI-XMA series is a versatile family of loop powered 4-20mA sensor transmitters with built in sensor excitation. They are simple to use and add new capabilities to existing systems. They are signal conditioners, sensor amplifiers that Condition sensor signals into a usable format. ROI-XMA 4-20mA sensor transmitters, can be used with: data acquisition systems, PLC systems, SCADA systems, and more. 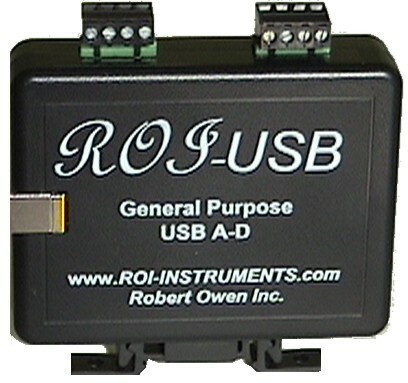 ROI-USB analog to digital converters are used where a Windows PC with a spare USB port is available. Used to measure analog sensor signals such as: voltage, current, and resistance. Turn a PC into an inexpensive data acquisition system, trend recorder, or data logger. Record sensors over time, monitor trends and track changes. The ROI-USB is a simple to use general purpose USB analog to digital converter for low cost sensor monitoring and recording. Works real time with Excel, as a simple data acquisition system, with on screen graph of changes. Use Excel to generate reports with live sensor data. 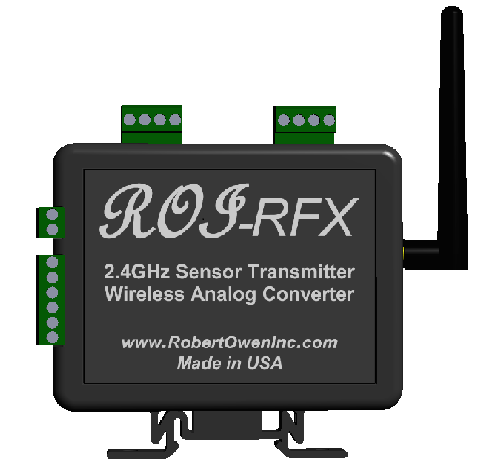 The ROI-RFX analog to digital converter is a simple to use Windows compatible wireless remote sensor monitoring system. 2.4GHz RF systems are standardly available (ships worldwide), and alternate frequencies on request (e.g. 900MHz, for North American). Set up wireless networks that connect sensors miles away. Create Wireless Sensor Networks. The ROI-RFX allows you to remotely monitor record sensors over distances of up to 1 mile/1.6 km, when used with the correct antenna. 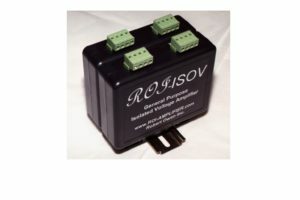 Use industry standard 4-20mA transmitters or 10K NTC thermistors. 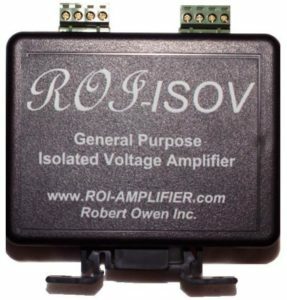 ROI-ISOV General Purpose Isolation Amplifiers. 10V bipolar +/-15V powered 2 way isolation amplifier. A-D input voltage protection and ground loop elimination. Isolation amplifiers are used where analog signal noise suppression, ground loop elimination, or high voltage potential separation is needed. Create Isolated Measurement Solutions. 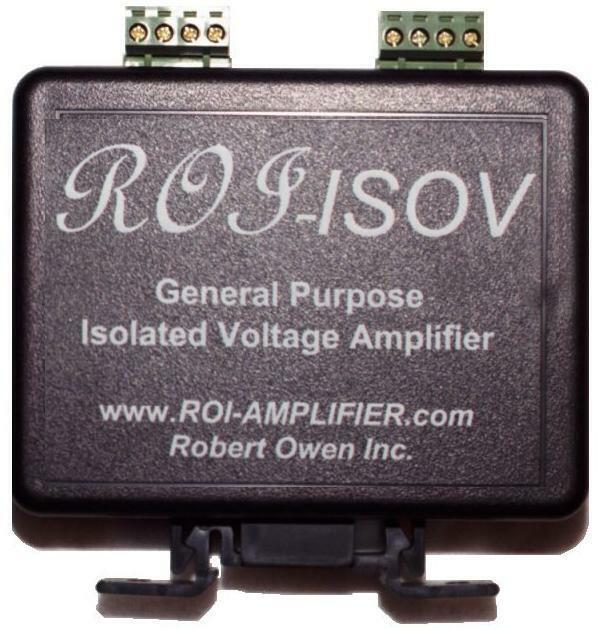 The ROI-ISOV10 is a simple to use isolated signal conditioner. Input and output sections powered by separate supplies, galvanic isolation accomplished via capacitive barrier. DIN rail mounting allows multiple units to be used side by side. Not seeing what Sensor Signal Conditioning Products you’re looking for?